You’ve got to love this conversation-starting black “Cindi” sweatshirt with its adorable pack of mutts portrayed on the chest. Black cotton polyester knit fabric has a smooth face and a plush, fleecy reverse. This black sweatshirt features an over sized fit, with generous long sleeves ending in rib knit cuffs. Falling to fingertip length, bottom of the shirt also boasts a black rib knit band to match that found at the cuffs and neck opening. 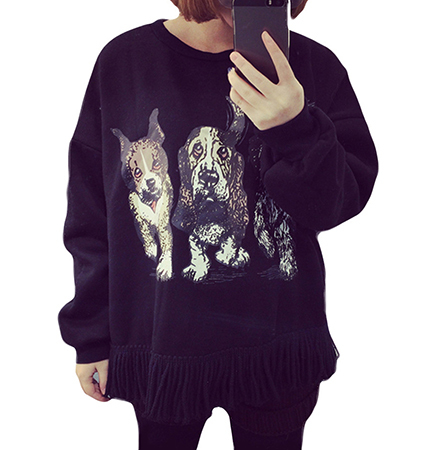 For best results, machine wash this black sweatshirt with its precious pooches, then line dry. Make a fashion statement of your own and bring the doggies along with you!